Woolworths have featured it here. Green bean curry. Possibly the bane of my childhood school-lunch existence. My mother knew exactly how to prepare those white bread sandwiches with the right amount of curry leaves, still attached to the stalk to put me off the curry, till well into my early twenties. Now, I dream about my mother’s dry braised green bean curry and sweet-hot carrot pickles. The unmistakable advantage of currying vegetable dishes is that it provides endless variation to the flavour profiles you can create – mild kormas from the North of India coat veggies in a creamy, rich sauce enhanced by the nuttiness of cashew nuts, Thai coconut curries red or green provide a lime leaf and galangal base that is fragrant and ‘exotic’ and the other countries of South East Asia open up the door even further. Creamy, hot and spicy, tomato-tangy. It is no wonder so many people in these countries consume a mainly vegetarian diet. Vegetarian meals need not be the ubiquitous boiled spud, steamed mushrooms or one-risotto option found on many restaurant menus. Playing with spices opens up the options for exciting, flavourful vegetarian dishes endlessly. 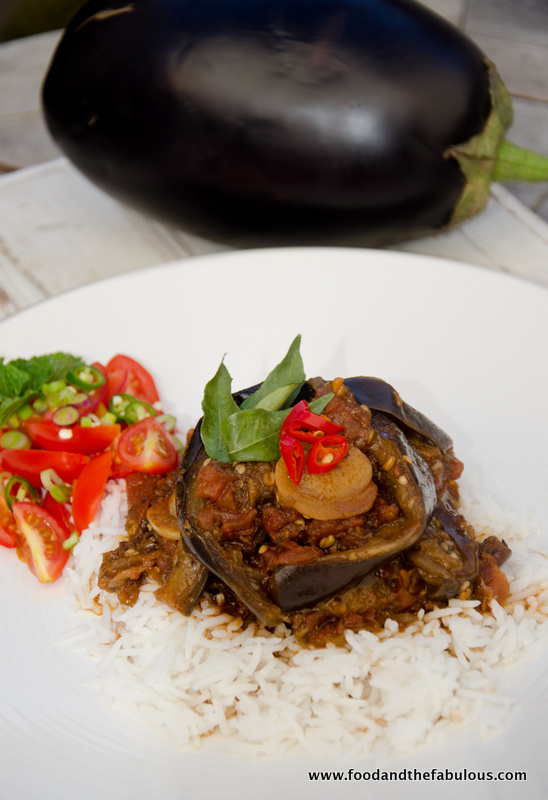 My Sri Lankan style Aubergine Curry is based on a favourite recipe from Rick Stein’s Sri Lankan Crab Curry found in his beautiful Far Eastern Odyssey (Uncle Rick is one of my favourite celebrity chefs- he really understands food, its origins and people). 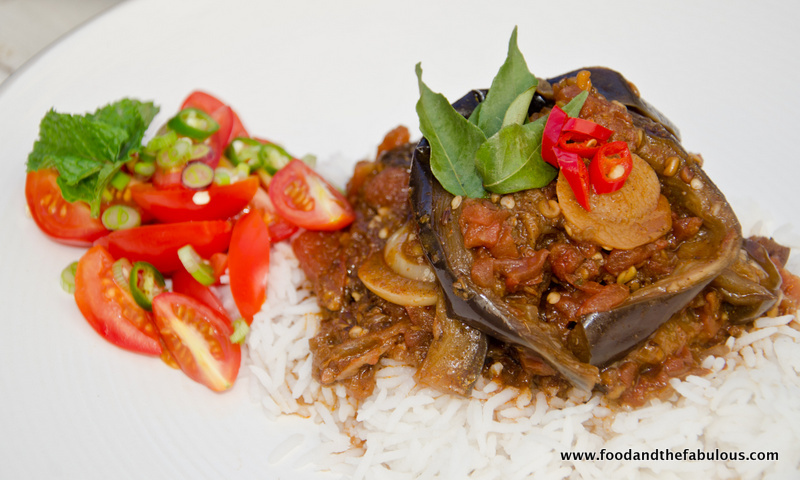 I have made versions of the crab curry with great success and thought the aubergines would stand up to and display these flavours wonderfully. The bitter nuttiness of fenugreek seeds soften both in flavour and texture as they cook down, melding beautifully with the tamarind enhanced tang of the tomato gravy (chutney) and the heat of the masala and chillis are tempered by the sweet coconut milk. Overall, the dish is fiery (I wasn’t sure if all my guests could handle heat and how much of it, so I made it fairly moderate as far as bite is concerned) but silky too. Preparing this the night before allows the curry time for flavours to develop and deepen. Do make sure you taste again and adjust seasoning as needed, before serving. Slice the aubergine in half lengthways. Then slice in 1/2 cm slices and cut each slice in half again along the length. Heat a wide bottomed pot on medium and add half the oil. Fry the onions and bay leaves for 2-3 minutes. Add the fenugreek, cumin, mustard seeds, curry leaves and chillis and fry, until aromatic. Be careful as the mustard seeds will start to pop. Add the aubergine and garlic and mix well, turning up the heat. You will have to add remaining oil. Cook for 4 minutes, stirring. A splash of water may be needed. Add the garam masala, the tomatoes and the water and mix. Add sugar and salt and turn down the heat back to medium. Add the tamarind water or paste and stir well. 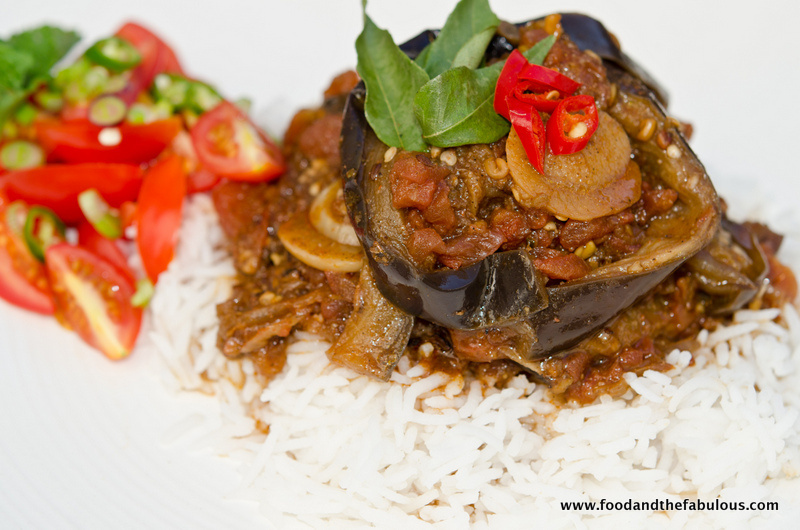 Cook for until the gravy reduces and the aubergines are softened and almost done. Add coconut milk if using and adjust seasoning. Cook until done. Garnish with curry leaves or coriander and serve with basmati rice or roti. I featured this recipe on the blog, previously here. Thank you kindly for the visit and the lovely words! Look forward to you visiting again.